With their capability to increase the efficiency of solar systems, module level power management (MLPM) solutions are set for fast growth, with almost 40 percent of residential photovoltaic (PV) installations expected to use the technology in 2014, new IHS iSuppli research indicates. 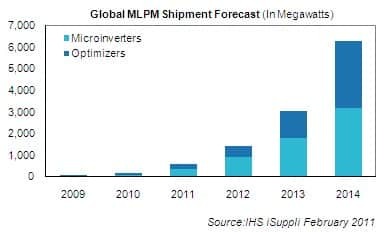 Global shipments of MLPM systems, a category consisting of microinverters and optimizers, are set to rise to 6.2 gigawatts (GW) in 2014, up by nearly a factor of 40 from 160 megawatts (MW). By the end of 2014, 38 percent of residential PV installations worldwide will employ MLPM solutions, up from 2 percent in 2010. Microinverters convert direct current (DC) power from a single solar module to alternating current (AC) power, while optimizers use DC-to-DC converter technology to take full advantage of the power harvest from PV systems. PV systems typically increase their energy harvest using the so-called “three efficiencies:” efficient energy conversion, efficient manufacturing methods and efficient use of materials. However, MLPM increases harvest through a fourth route: the efficient management of solar modules using semiconductor technology. MLPM solutions are particularly attractive for residential PV systems because they make the installer’s job easier, provide a simpler project design and require little high-voltage DC expertise. The United States and Canada presently are leading the residential MLPM markets, with microinverters the top technology. MLPM solutions currently carry a cost premium compared to solar systems using normal inverters, with microinverters adding $0.20 to 0.25 per watt for installations, and optimizers adding $0.15 per watt cost. However, with their high semiconductor content, MLPMs benefit from the cost reduction benefits of Moore’s Law. The average selling price (ASP) for microinverters will decline to $0.29 in 2014, down from $0.88 in 2010. The optimizer ASP will fall to $0.08 in 2014, down from $0.18 in 2010. Enphase Energy at present dominates the microinverter area with more than a 90 percent market share; Enecsys Ltd. and SolarBridge Technologies recently entered the market. Meanwhile, SolarEdge Technologies Inc. has an almost 70 percent share of the optimizer market. With the MLPM market still in its very early stages, competitors are starting to flood into the business. There are at least 15 companies in the MLPM space, with more coming over the horizon, including inverter market giant SMA Group, which is believed to be readying a solution. Read More > PV Microinverters and Optimizers: Can Moore’s Law be Disruptive Again?